No, these photos are not old, snapped weeks and weeks ago and forgotten about, they are quite current, as we've still been having some deceptively chilly days, and truthfully I wish I'd been wearing something more like this to my sister's graduation! It was right by the water in a tented pavilion, which translated to, everyone was freezing in this March-May weather we've been having. At least it didn't rain! And the ceremony was enjoyable and not overly long. Graduations are always so exciting, and it's wonderful to hear the speakers and get a dose of the optimism of those just starting out, because it's also a reminder that it's never too late to start a new chapter, or a new adventure. I'm loving this classic look! I agree graduation speeches are full of inspiration and motivation. We just went to a graduation this weekend, and I was thinking the same thing---that women my age need this same kind of speech---the go forth & conquer kind!! I love this outfit! We are already kind of into warm weather territory so I'm worried about summer and will gladly trade! Oh yes, those graduation speeches are the best, they are a morale booster. Sorry to hear the graduation was chilly because of the crazy weather. Here graduations area always indoors in air conditioner. My only graduation that was held outdoors ( and I roasted ) was my high school graduation - these were always done on the gorgeous school front lawn and was kind of a tradition, it was a US school. After several weeks of wonderfully summery weather, we are back to grey skies and chilly temperatures. I have been back in my trust jeans and sweaters, so for me, this outfit makes perfect sense right now - I'm really just wishing I had the trench coat and lace-up flats to recreate it, to be entirely honest! I'm sorry about the cold spell (and that you were freezing at the graduation!) but I do love this gorgeous classic look. We had gorgeous weather over the weekend, but now there is TONS of rain in the forecast for the next 10 days... wishing I would have ordered some rain boots this year! Come on down to Florida...it's nice and warm. :) Love the look! 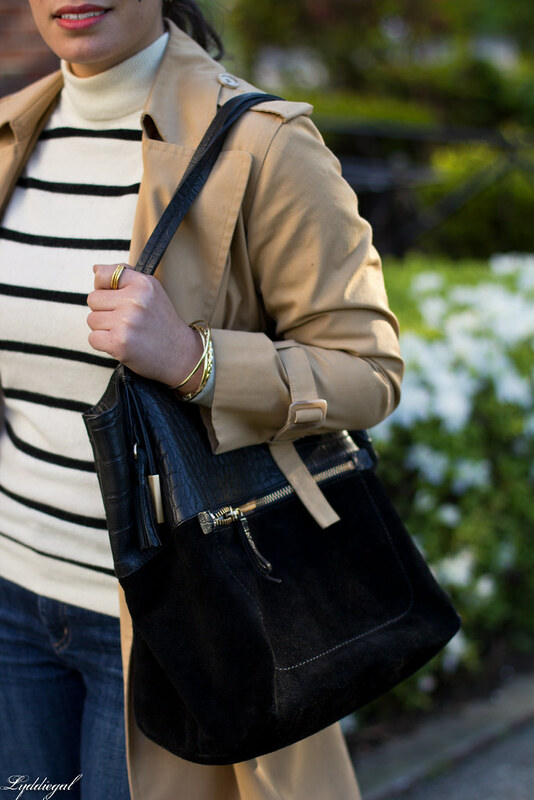 Love your stripes, and that bag is so cute, the texture is great! Such a classic look, love this trench. You look gorgeous, I love this look and I actually wear something similar pretty often- it's my go to outfit! 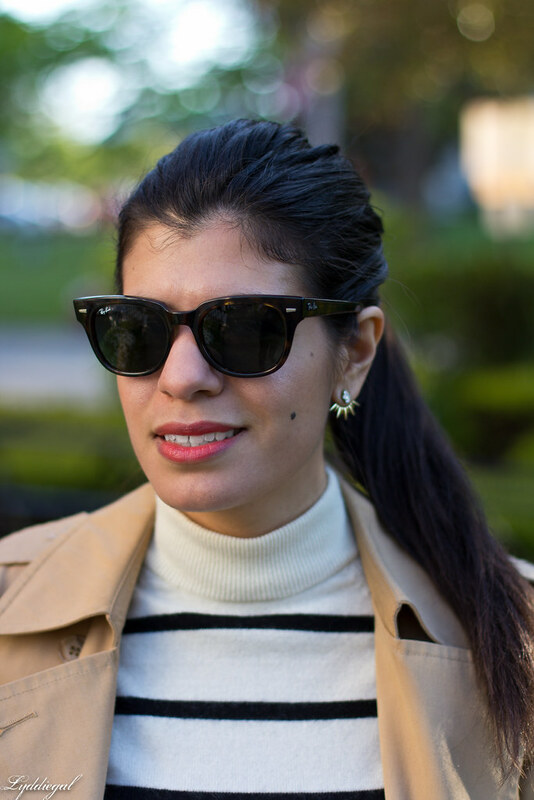 This is such a chic look, thanks to the cooler weather! ;) Love the trench and denim combo! It has been a little chiller than normal here also, which I've been loving. This outfit is so chic! I love the stripes and trench combo! 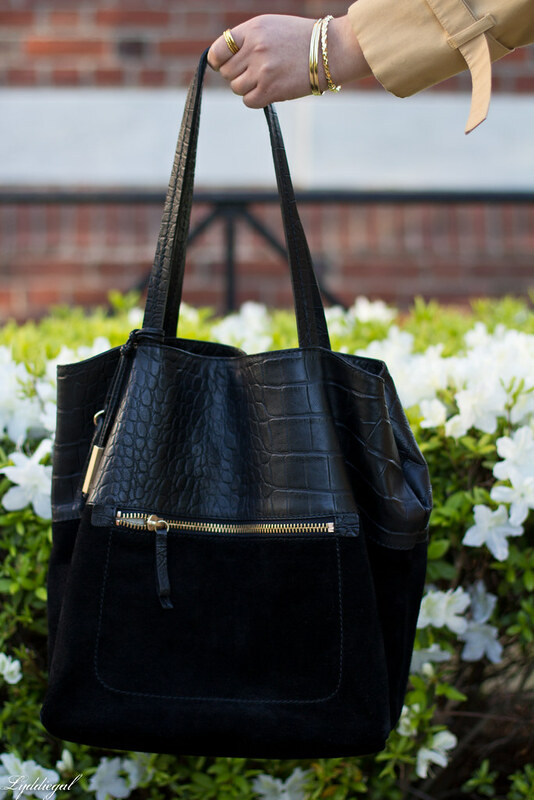 Such a classic look and so chic, too. Lovely! 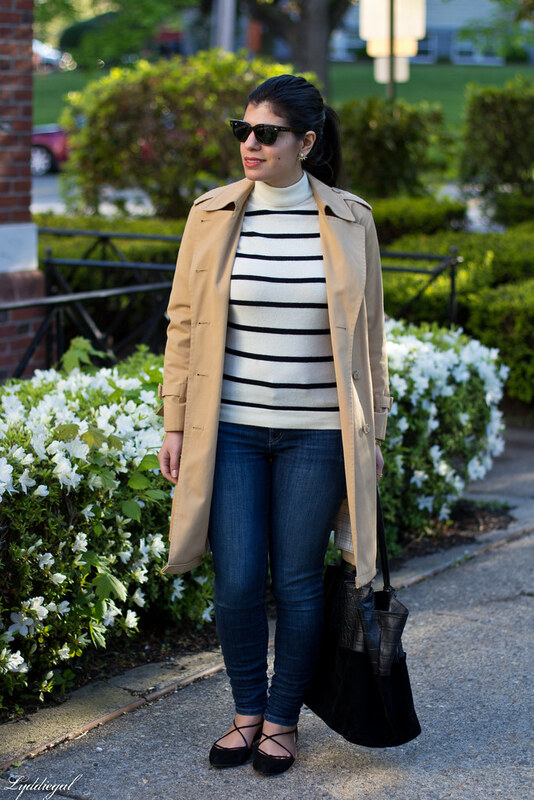 Loving your classic trench! So perfect with the stripes! This is a great look - remember it for fall:) Hopefully it will warm up there soon. This week, we are FINALLY Getting warm temps. I'm so excited! Sorry that you've been having chilly weather still! At least you are looking chic in with the stripes and trench coat! 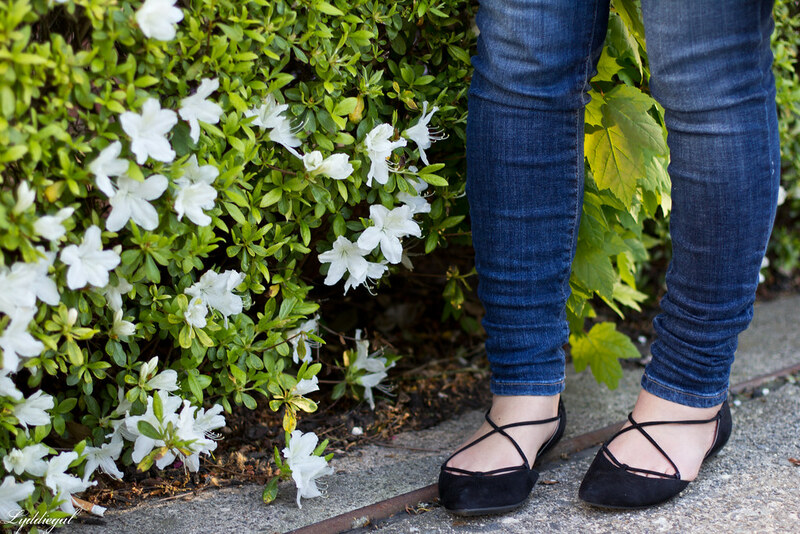 Love this outfit for those cooler spring days. You never know what temperature you can get each day! Another amazing look! Love the stripes with the trench! Come take a look at another outfit I am wearing for my latest collab with Los Angeles-based brand TOBI - I'm sure you'll love it! Black and white stripes and a tan jacket is always one of my favorite combos. So classy! What a wonderful way to look at graduations you're attending. Sorry to hear it was so cold, but I'm glad it gave you a new outlook. That coat is so timeless. I love this classic look on you. It makes me wish -- almost -- that it was a touch chillier out so I could recreate it!